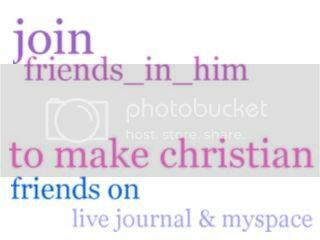 this is a community for Christians to meet & add other Christians on live journal & myspace if you'd like. 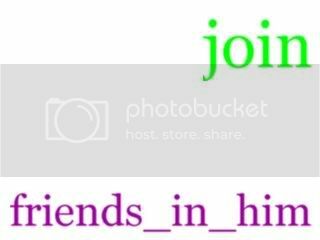 feel free to advertise other Christian communities in posts, but no rating communities please. as well, if you want to be a sister community leave a comment in one of the mods' journal & we'd be happy to add your community to the user info. 1. this is a place for fellowship, be nice to everyone please. 2. don't post anything offensive, it will be deleted. 3. if you post something long, please use an lj-cut. new members: make a post introducing yourself so everyone can get to know you & add you. make sure to include a link to your myspace if you want people to add you! JUST COPY & PASTE THE CODE, THE LINK TO THE COMMUNITY IS INCLUDED IN THE CODE.